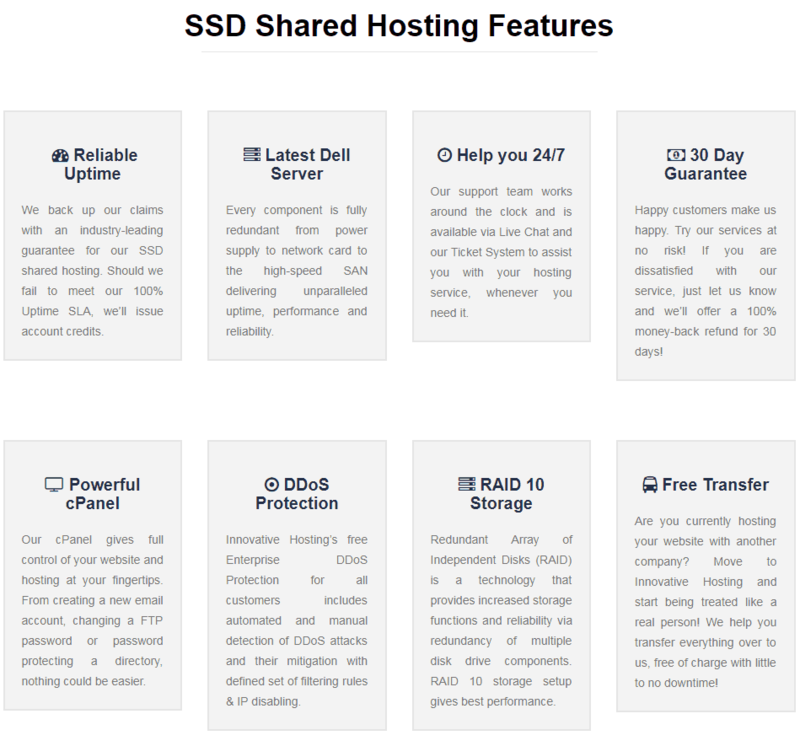 Innovative Hosting Review 2019: Is Innovative Hosting a Good Hosting? There aren’t many hosting providers that will be able to beat Innovative Hosting at its rich features and competitive pricing. Innovative is based in India and has been in business since 2012. It has three different data center locations spread across the U.K., U.S.A., and Singapore. They started as a website hosting provider but have slowly extended their business to offer other services including VPS, dedicated servers, and cloud servers. They claim their servers are thirty times faster than average, which is achieved through SSD hard drives that allow fast transfer of data. The Raid 10 storage adds reliability as well through redundant multiple hard drives. Most of their hardware comes from DELL and is kept up-to-date to ensure reliability and performance. No matter which package you opt for at Innovative Hosting, a free site builder comes with it, which is a welcome feature for those with little technical knowledge. The Softaculous application installer is included in your cPanel as well which aids in the easy installation of software like WordPress, Joomla, Magento, etc. These features, together with friendly and quick customer support, make this host ideal for beginners. Innovative Hosting offers both free and premium SSL certificates, but that’s not all they offer to provide security. You can get malware protection through the Sitelock Malware Protector and add the WhoIs privacy feature to your website as well. Even though their infrastructure makes any malware intrusion difficult, you still have protection against DDoS attacks. All in all, their security features ensure you have a safe and reliable hosting experience. The four plans on offer at Innovative Hosting are Basic, Professional, Ultimate, and Business. While all packages are rich in features, it’s the Business package that steals the show. It comes at an affordable price and includes unlimited features. It’s hard to find hosting providers that can offer an unlimited package at this price. On top of that, they provide you with a 30-day money-back guarantee. This guarantee does not apply to any promotional packages, so make sure you read the terms and conditions of any promotion carefully. There doesn’t seem to be any flexible payment plan on offer and yearly payments are the only solution. They accept a number of payment methods, so you can easily pay irrespective of where you are in the world. Innovative Hosting offers both live chat and a ticketing support system. The live chat isn’t available 24/7, but the ticketing system will usually get back to you within 15 minutes, so it’s a great alternative to the live chat. They also have a knowledge base section but it only contains articles on some basic topics. onClick="trackClickout('event', 'clickout', 'Vendor Page - Visit User Reviews', 'Innovative Hosting', this, true);"
I am super impressed by Innovative Hosting support and I am happy customer of them, Recently I emailed them for help and one of there executive replied instantly and the query was solved in minutes, I love Innovative Hosting because of there support, pricing and up time. Innovative hosting has unlimited hosting plans that come at a very attractive price. Even the smallest package offers more than enough features, so it’s hard to see any negative aspect of their hosting. Highly recommended. Wondering how Innovative Hosting stacks up against other Web Hosting companies? Enter any other Web Hosting company and we will give you a side-by-side comparison.